For almost a year now, my Tuesdays have become “Taco Tuesdays.” It’s turned into so much of a tradition that, when skipped, I am beset with strong cravings for Mexican food. Yes, I must now have weekly tacos. As most of you know, tacos are best paired with a cold cerveza or a margarita, but I decided to get a little creative and whip together a sangria for the latest get-together with my girlfriends. It’s an impressive addition to any party, but also quite simple to put together! Yes, those are my polka dot boxer shorts in the corner. Who gets all dressed up to make a mess in the kitchen? 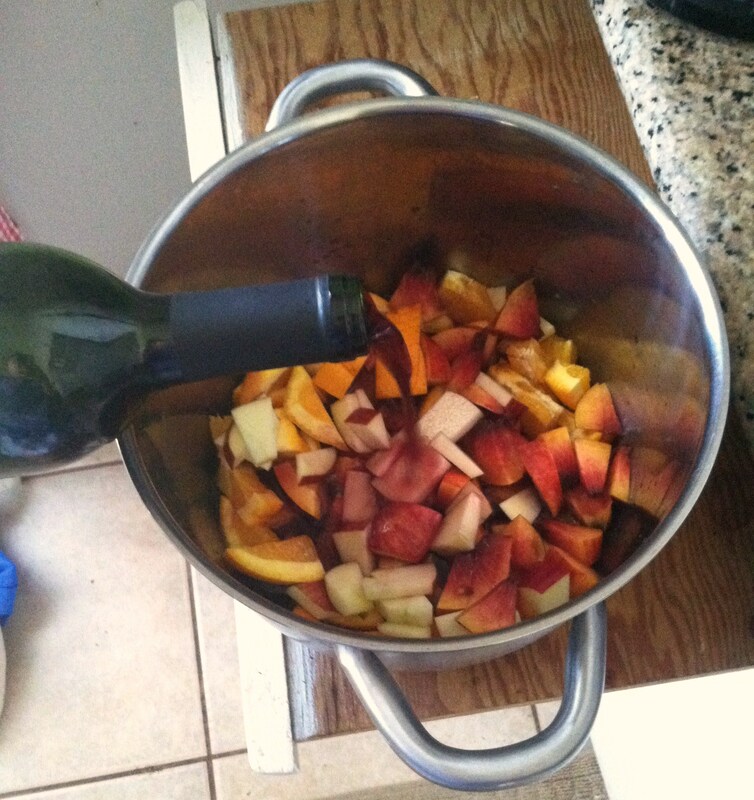 Chop up all fruit into bite size pieces, cover with wine and liqueur; stir, refrigerate, and let rest for 2+hours. When ready to serve, top with soda or sparkling water and enjoy! I know, it’s incredibly high-tech. It’s also foolproof as long as you taste as you go. Should you prefer a stronger sangria, you’re welcome to edit the recipe to your liking. You could also easily make a non-alcoholic sangria with a grape juice, or, even better, lots of kombucha! And, let’s not forget: it’s an easy way to make your after work cocktail count as a serving of fruit. Adulthood is basically a bunch of life-hacks in disguise. Oh, and sangria.